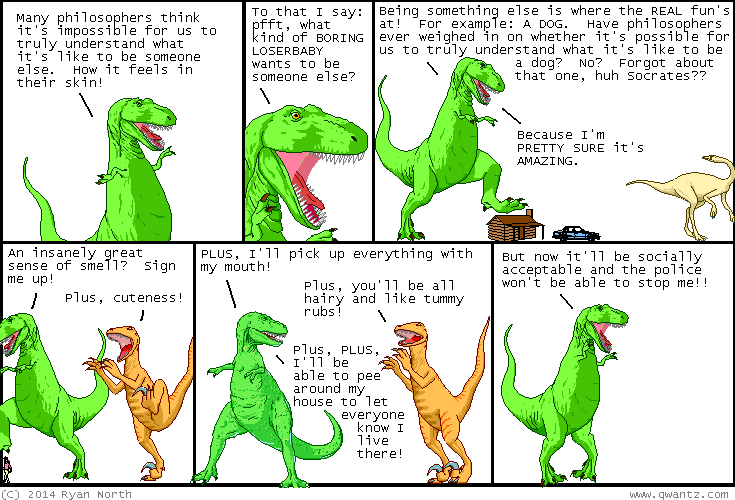 Dinosaur Comics - June 24th, 2014 - awesome fun times! June 24th, 2014: I have been informed that while we may not know much about dogs, we have considered bats! PHEW. Midas Flesh #7 comes out tomorrow! SECOND-LAST ISSUE, you guys! What crazy things will happen in it?? HINT: ALL THE CRAZY THINGS. Here's a preview! One year ago today: According to Wikipedia, "...The Goose That Laid the Golden Eggs is among the best known of Aesop's Fables (Perry 87) and use of the phrase has become idiomatic of an [excellent scientific investigation] motivated by [the desire to better understand the universe we live in].